The following is a video of a speech I delivered in A.D. 2012 at a Black church on the South side of Dallas. I’d forgotten about it. Today, a friend sent me a current link. If I say so myself, this video offers a good summary of my fundamental notions on “Man Or Other Animals” (MOOA) laws, individual sovereignty and spiritual warfare. It may take some effort, but if you can understand this presentation, you’ll understand what this blog is all about. It’s worth you time. In A.D. 1961, the United States Supreme Court decided the case of Torcaso v Watkins. The case hinged on the right of a man who had otherwise qualified for the office of Notary Public in “Maryland” to assume that office without first confessing (as required by the Maryland Constitution) that he believed in God. The man was an atheist and refused to falsely confess that he believed in God when, in fact, he did not. More, he contended that the requirement for a confession of a belief in God was an unconstitutional “religious test”. The Supreme Court ruled in favor of the atheist as struck down the requirement that public officers had to affirm their belief in God as a prerequisite for holding public office. With that footnote, the Supreme Court elevated “Secular Humanism” and other atheistic philosophies to the status of “religions“. The Jefferson Memorial in Washington DC was commissioned about A.D. 1934 and dedicated (not including in the final bronze sculpture) about A.D. 1943. I visited the Jefferson Memorial back about A.D. 2000. As I recall my visit, I saw a stone ring at the base of the Memorial’s dome-shaped roof. On that ring, excerpts from some Jefferson’s most memorable statements were carved in stone. As I recall, one of those excerpts included the phrase “endowed by their Creator with certain INalienable Rights”. 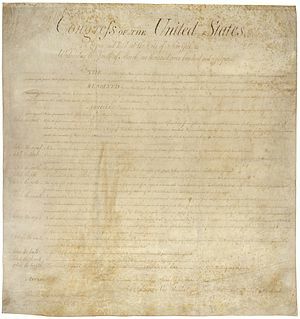 It’s absolutely certain and clear that Jefferson’s text in the “Declaration of Independence” (true name, “The unanimous Declaration of the thirteen united States of America”) referred to “UNalienable Rights”. 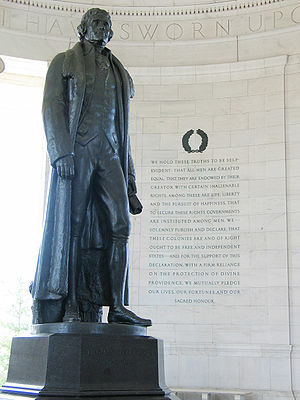 Nevertheless—on Jefferson’s own Memorial—the word carved in stone is “INalienable”. It’s inconceivable that the word was misspelled into stone by accident. It’s inconceivable that the mistake has “accidentally” gone uncorrected for most of 70 years. Still, perhaps my recollection is faulty. Maybe (as GW Bush might say), I “misremembered” and the word “inalienable” does not appear on the stone ring at the base of the Memorial’s domed roof.